Recently, City Hall entered into an agreement that will acquire land just off the Rail Trail in the Prospector area. This is part of a conservation deal that keeps the possibility of using a small area of the acreage for a housing project open. The transaction, which was unanimously authorized by the City Council, involves just a bit more than 14 acres of land on the south side of the Rail Trail. The land also climbs a hillside on the south side. The deal cost $500,000 and was entered into with Ted Sommer, the landowner. City Hall indicates that the transfer will be funded using two sources. One source is City Hals housing fund, while the other is generated from a portion of sales taxes that are set aside for uses such as conservation acquisitions. Staffers at City Hall indicate that there is a possibility that a small portion of the land may be used for a municipal housing project. However, the decision has not been finalized and it is not known the type of project or how many units it would involve. One report that was submitted to officials also indicated a park might also be built on part of the land. The conservation efforts by City Hall date back more than two decades and are considered one of the governments most highly praised programs. 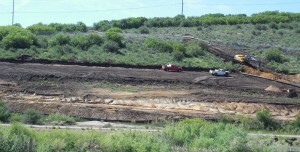 Officials have set aside large tracts of land from development. These areas include areas such as the S.R. 225 entryway and Round Valley. As you can see, it is not uncommon for large parcels of land inside the city limits to be acquired by City Hall. At YouInParkCity.com and KW Park City Keller Williams Real Estate, we understand the intricacies and ins and outs of land acquisitions. If you are interested in purchase or selling any type of real estate in our area, please contact us. Our knowledgeable, experienced, and friendly staff can help you maneuver through a successful real estate transaction, no matter the size, as we specialize in all types of Park City real estate. 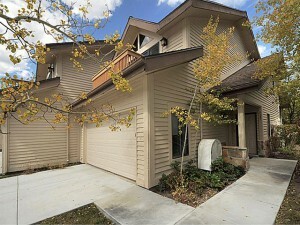 Posted in Park City Economy, Park City value, sellers | 0 Responses to "Deal Reached to Acquire Acreage Near the Rail Trail"
This year has seen a huge increase in the Park City Real Estate Market. We are seeing numbers similar to those we experience prior to the 2008 recession numbers. According to statistics from the Park City Board of Realtors, for the first two quarters of 2015, home sales are up 9 percent over the same period in 2014. This represents the highest numbers for the first of half of any year since the recession. Additionally, during the same time period, total dollar volume is up by 11 percent. We have been experiencing an improvement in the real estate market over the past two years; however, the growth was slow become there were not many homes on the market. 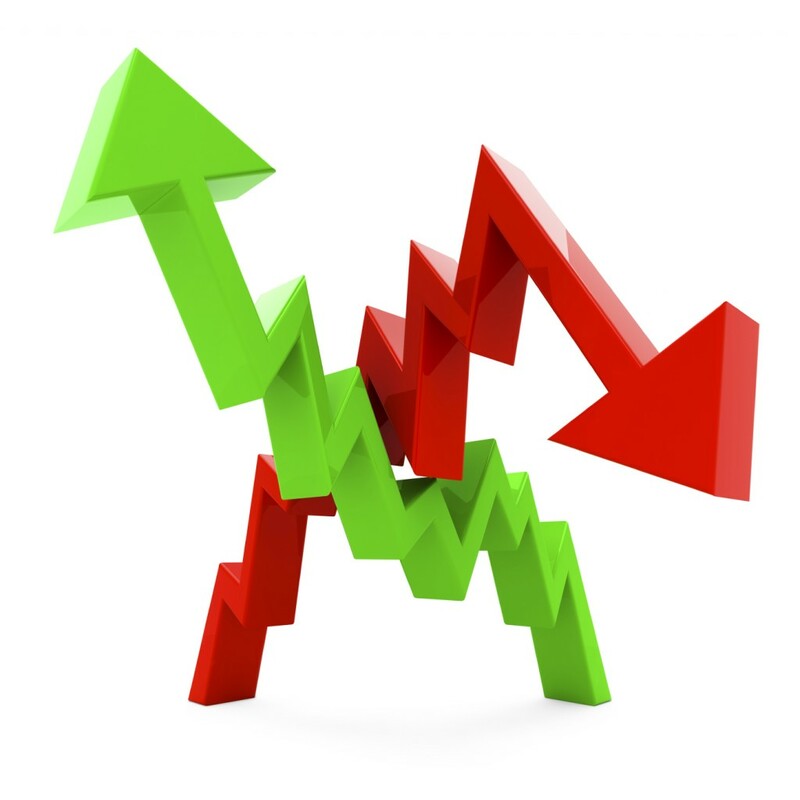 Rising prices during the first quarter of the year helped open up the market. Record lows were seen in terms of inventory and that drove up prices. Many who were thinking of selling waited for prices to rebound and then made the decision to sell, which resulted on more homes appearing on the market during the second quarter of this year. Throughout the country, the real estate market is becoming stronger, which reflects the boost in the Park City market. Additionally, Utahs economy is one of the strongest in the country, which has brought many of people to the Park City area. According to figures from the Board of Realtors, sales have been strong in areas such as Park Meadows, Old Town, and Prospector. Neighborhoods in the Snyderville Basin are also experience strong numbers, with the median sales price of a single-family home in the basin coming in at $850,000  up 18 percent. One message being seen by area realtors is that Vail Resorts will be bringing people to Park City. Vail Resorts presence in Park City will be bringing both visitors and new residents to the area. If you are interested in buying or selling real estate in the Park City and surrounding areas, feel free to contact us at YouInParkCity.com. Our professionals will be able to help you either buy or sell property in this fast-growing and every-changing marketplace. Posted in Park City Economy, Park City Real Estate Notes, market statistics | 0 Responses to "Park City Real Estate Numbers Surging in 2015"
How could the new RESPA rule affect our Clients? I originally wrote this back in May anticipating implementation August 1, 2015. When the start date was delayed I shelved this thinking this would be addressed by the state or our forms committees. I havent seen any resolution to what I think puts our buyers at risk. As we know the new RESPA rule will require, for contracts written starting October 3, 2015, that the closing disclosure be in the hands of the consumer no less than 3 days prior to closing. As is often the case with new regulations, the implementation of them can have unforeseen and possibly negative results. In May I attended a class on the new regulation and asked the presenter how an agent should deal with it when the contractual settlement and closing deadlines are delayed as a result of this regulation. The response was that the agent should just ask for extensions. As we all know extensions are not always granted. If the extension is not granted and the settlement and or closing do not occur according by the contract deadline could the seller view this as a breach of contract? Could the seller decide decide to keep the earnest money and accept an offer (better) from another buyer? I am not an attorney and I dont know but I am certainly concerned. I have been trained that if something is not part of the contract it doesnt have standing in court. Should there be an addendum to the REPC that defines how delays in settlement and or closing as a result of complying with Dodd Frank TRID regulations will be dealt with?. I am sure our brokers and the State will come up with a form that addresses this but until they do should our clients have attorneys draft an addendum to cover this? The buyer and the seller agree that any delays in the Settlement and Closing Deadlines that are a result of complying with the RESPA regulations implemented as of October 3, 2015 will be accepted by both parties. The settlement and closing deadlines will be extended to allow for compliance with the regulation. Some agents are of the opinion that the chances of there being a delay and the seller opting to cancel the contract are small. I agree but I am unwilling to roll the dice with my clients money. I have no interest in asking a seller for an extension with earnest money at risk. On the flip side I wouldnt want this to be something my seller has to think about at the last minute. We should address this when we are writing and negotiating contracts. October 3rd will be here soon. Please talk to your Brokers if you are an agent and your agent if you are buying or selling a home. Posted in Park City Economy, Park City value | 0 Responses to "How could the new RESPA rule affect our Clients?" Park City Named Friendliest City! Was it a surprise when we found out that Park City was recently named in a Conde Nast readers poll as the Friendliest City in America? Actually no, it wasnt! All of us at KW Park City Keller Williams Real Estate and YouInParkCity.com know the myriad reasons we were awarded such a standing. Park City was actually highlighted in a slide show on CNTTraveler.com  a site that reaches nearly 2.6 million travel enthusiasts  titled The 2015 Friendliest and UnFriendliest Cities in the U.S. There are so many reasons for Conde Nast to say Park City is a great place that brings city life to outdoor enthusiasts, film geeks and families. We also like to point out that Park City is a well-known travel destination renown for hip culture, a rich history and of course, its exciting party atmosphere. Visitors and locals alike love the warmth and atmosphere of the city, whether they are enjoy the great banter from bartenders at establishments such as The Spur, The No Name, or OShucks. 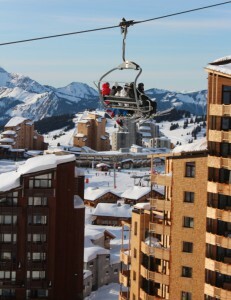 They can also enjoy high-end service at places such as St. Regis and the Montage  theres something for everyone. We cant forget to point out that our area ski resorts have also ranked high on the ratings for their customer service and satisfaction from both visitors and residents. There really is no better place to ski that Park City. Not to mention the great summers we have with all sorts of great activities such as hiking, biking, and fishing. And of course, youll be finding yourself among some of the friendliest people around during the many outdoor concerts happening all summer long. KW Park City Keller Williams Real Estate and YouInParkCity.com are proud to be a part of what is now known as the Friendliest City in the U.S.. We invite you to stop by and check out some great real estate that can put you in the heart of this area so you can experience all the wonderful aspects of our great city. Posted in buyers, Park City Economy, Park City Neighborhoods, Park City value | 0 Responses to "Park City Named Friendliest City!" Theres a new business model for selling real estate in the Park City area that is becoming increasingly popular. As you may know, the usual way to sell property is to hire a real estate agent, who then puts the property on the market and stages it. 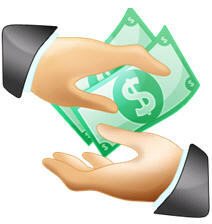 Then you wait for an acceptable offer, which with any luck, will let the seller walk away with a substantial check. However, now a new approach has hit the Park City real estate market. It has become an enticing proposal for homeowners to put a property up for auction  especially if they have the desire to sell the home quickly. Instead of waiting for lengthy periods of time to sell high-end property, homeowners are now auctioning their real estate when they are willing to risk getting a lower price in exchange for a faster sale. Essentially, homeowners will pay an auction firm an upfront fee to market their homes across the country, as well as internationally. 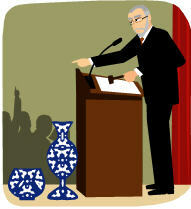 This will result in a large number of potential buyers by the auction date. In reality, one thing that real estate agents may not do as effectively as an auction house, is to bring a sense of urgency to the sale. Additionally, the process can be so successful that an actual action doesnt happen. Agents in this area have seen properties that have been ready for auction go to a buyer who just didnt want to lose the home, so a price that is just to good to pass up is offered. And for sellers, this is a great outcome. There are, however, some risks that may come with the auction process. For instance, with an absolute auction, which is an instance where the top dollar that the bidders are willing to offer becomes the final price. There is no turning back for sellers once the auction has started. The entire process can be intense. Sellers have no guarantee that the price they want for their property will be met, so it is definitely not a process for the faint of heart. 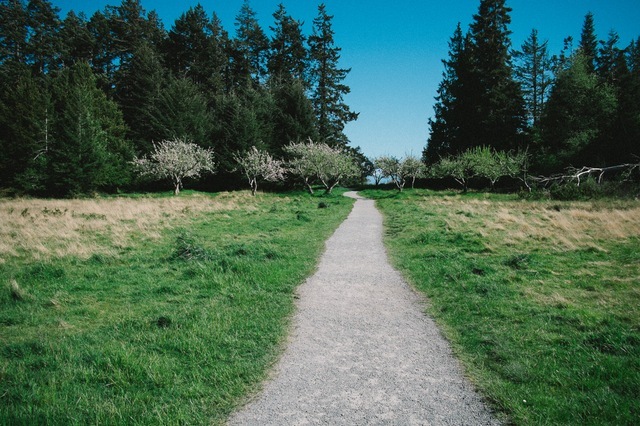 It is however, a good option for those who are willing to take a more aggressive approach to getting their properties sold  especially those within the higher end markets. If you are interested in selling properties through an auction process, or even through a traditional method, the YouInParkCity.com Group at KW Park City Keller Williams Real Estate can give you a distinct advantage. Contact us today to discuss all your options! Posted in buyers, Park City Economy, market statistics | 0 Responses to "New Way to Sell Real Estate: The Auction Block"
Summer 2014 sees a construction boom in Park City, UT. Winter in Park City Utah is a tough time to build, that isnt to say that there are not a lot of construction projects going on during the winter, they are just more prevalent during the summer months. From the turn off highway 80 traveling into Park City the new construction can be seen. 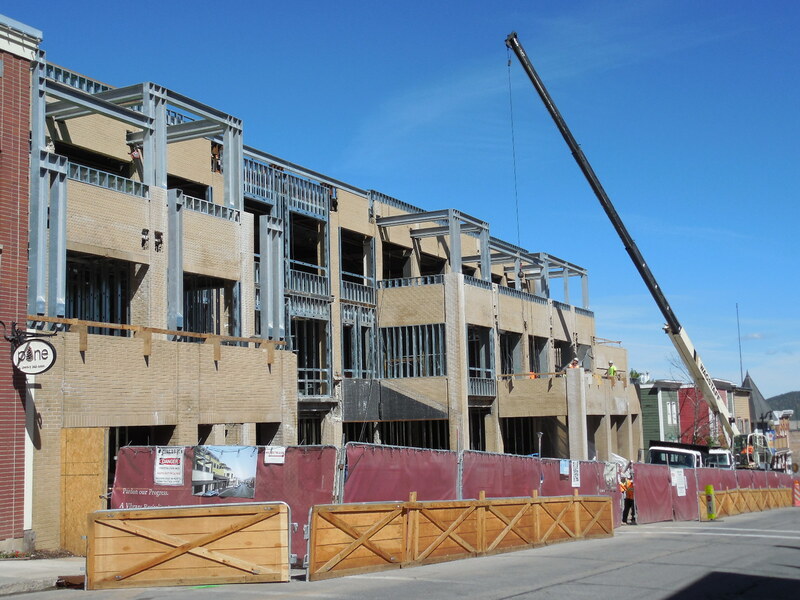 The Newpark Terrace townhomes above the parking garage at Newpark Town Center are taking shape; sixty percent of the sixty. The additional retail space at Redstone is done and the retail center is busier than ever. New exterior siding is being installed at the Fox Point at Redstone condominiums (this clears a long running lawsuit between the original builder and the HOA). Another small residential development is also working its way through the planning process. 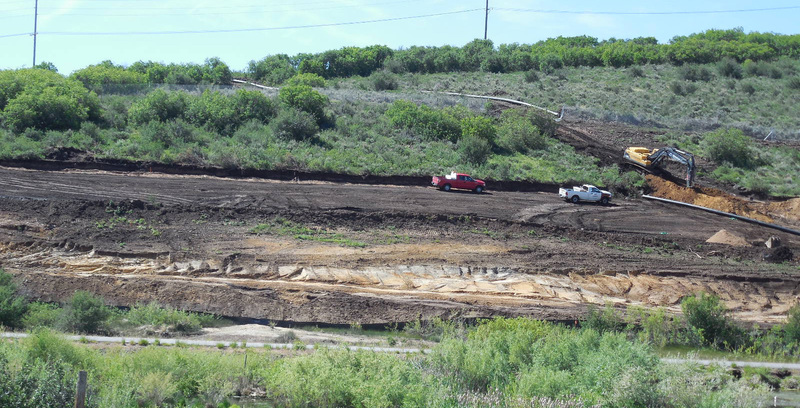 Work continues at Canyons Resort with the golf course which is scheduled for play in summer 2015 as well as projects near the base of the Waldorf gondola. Construction around town is evidenced mostly through home construction on some of the few remaining in-fill lots and the ever present road improvement projects. The Old Town area is the site of multiple projects both commercial and residential. Commercial spaces with residential units on top are part of two lower Main St remodels. 820 Park Avenue is ten residential condominiums with great ski and town access all of which had reservations before the project was introduced to the public. Near the top of Main St in the old in the old Main St Mall will be The Parkite with fifteen contemporary luxury residences. 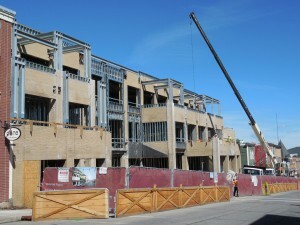 The Upper Deer Valley area has the Stein Eriksen Residences moving forward at full speed. This ski-in/ski-out development between the Silver Dollar and Last Chance ski runs was very well received over the winter and has many reservations already in place. Heading east out of Park City (affectionately known as the back door to town) the Park City Film Studios are well under way with their large project which includes Film Studios capable of film and television production, sound studios, Film School, Event Center and Studio Village. Just south of the Film Studio is the Park City Heights Development. The development covers nearly 250 acres and will contain 239 residences when complete. The builder Ivory Homes is one of Utahs largest builders has a proven track record an ability to complete developments in a timely manner. Further east on hwy 248, the developments at Parks Edge and Black Rock Ridge are selling condominiums as fast as they can build them. The Promontory Club area has over 50 homes in some state of construction (most all of these are custom homes and not spec builds). To further explore purchasing new construction homes or condominiums in Park City or to discuss how the addition of these developments may affect your current home or condominiums value, contact a local Park City real estate professional. Email us or call (888)968-4672. 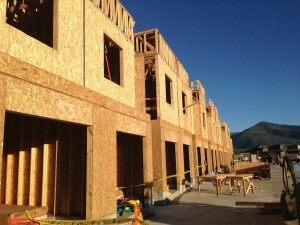 Posted in buyers, Park City Economy, sellers | 0 Responses to "Park City Real Estate Under Construction"
The first quarter of the year is historically the slowest for sales in the Park City real estate market. This often puzzles people as it also represents one of the busiest times in terms of people in town. Maybe our guests in Park City are too busy skiing, dining and enjoying all that Park City has to offer to spend their time hunting for properties; maybe it is the time delay between writing an offer and closing a sale; maybe once the decision to buy here has been made, buyers want to do more research and see all of the options while they are easy to see (not while renters are in town). 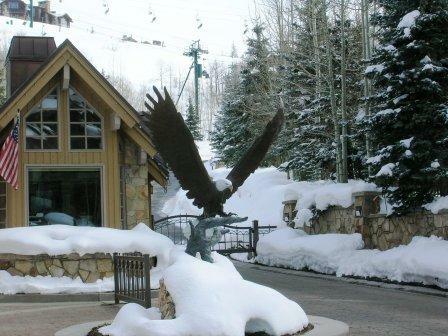 In any case, January through March is the slowest time for Park City real estate sales. 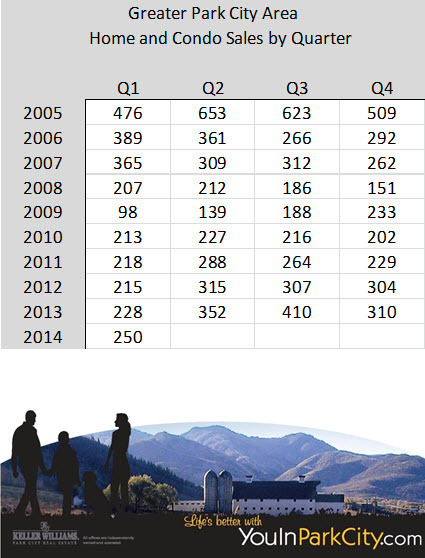 The first quarter of 2014 saw a nearly 20% jump in condominium sales for the greater Park City area versus 2013 and it was the best first quarter since 2007. Almost all of the increase came in condominium sales with the Old Town area leading the way. Old Town saw a 40% increase in the number of condominium sales versus the first quarter of last year. 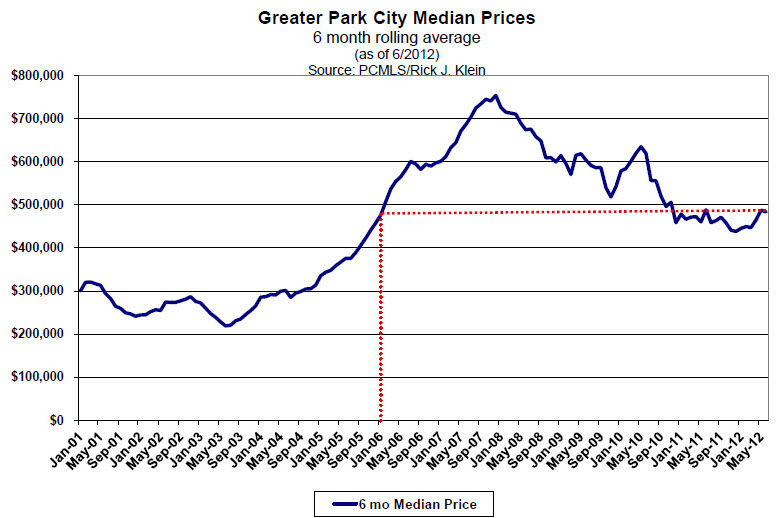 The median sales price of condominiums in the greater Park City area also increased from $430,000 to $445,000. Single Family home sales for the quarter were flat for the quarter versus quarter comparison, but the median price did rise by $10,000 to $875,000. Inventory levels rose during the quarter, but there is still a lack of supply of properties below the median sales price. Fewer than 70 homes are available for less than the median sales price from the first quarter which translates to just over 4 months supply at the current absorption rate. Similarly, condominium inventory below the median sales price for the quarter represent only a 6 month supply at the current sales pace. The lack of inventory has not translated to large price increases and it is those homes that show well and present a strong value that are selling quickly. Some neighborhoods are experiencing price increases while others have stabilized. For assistance in Buying or Selling in Park City, UT contact the YouInParkCIty.com Group for in depth analysis and expert advice focused on the property type and area of town that matters to you (888)968-4672. Posted in buyers, Park City Economy, Park City Real Estate Notes, Park City value, sellers | 0 Responses to "Park City Real Estate Sales 2014: Q1"
Park City Real Estate prices have been trending up for the past year or two now (we here at YouInParkCity.com called the market bottom around February of 2012). Some areas are seeing prices rise much faster than others. Summer generally sees an increase in sales of the low to middle price point single family homes in Park City and this year has been no exception. Areas with easy access to Salt Lake City as well as local Park City amenities are in the greatest demand. A few of the areas that we generally see heat up during the summer include Silver Springs, Park Meadows, Trailside Park, and Jeremy Ranch, Pinebrook and Prospector. The first half of the year shows Trailside pricing up by 23%, Park Meadows up by 25%, and Pinebrook up by 15%. The variables of the home sizes and age make the relatively small number of homes sold a year ago have the ability to skew the numbers, so while prices are definitely up, home values have not increased by these amounts. The Snyders Mill area of Silver Springs though may actually have seen this type of increase. While the Park City Board of Realtor statistics show only a 7% rise in prices for the Silver Springs area, sales in Snyders Mill represent one of the hottest neighborhoods in Park City. This year has 4 of the top ten highest sold prices that have ever been paid for a home in the Snyders Mill subdivision of Park City. Three of the homes have sold recently are the 2nd, 3rd and 4th highest per square foot values that have ever been paid in the Snyders Mill area. Current pricing and sales are eclipsing the peak pricing from 2007. When the subdivision was originally built in the early 1990s, homes sold for as little as $90/sq ft. Tastefully remodeled homes in Snyders Mill are now selling for over $300 per square foot. The combination of a well-kept neighborhood in a central location with easy access to Park City (historic as well as the new area at Kimball Junction) and pricing in the sweet spot of the Park City real estate market ($500K-$800K) make Snyders Mill one of the hottest real estate neighborhoods in Park City, UT. For information on buying or selling in Snyders Mill or any Park City area neighborhood contact a real estate professional with YouInParkCity.com (888)968-4672. Posted in Park City Economy, Park City Neighborhoods, Park City value | 0 Responses to "Park City Utahs Hottest Real Estate Neighborhood"
Real estate sales in Park City, UT so far in 2013 continue to show strength. Sales when compared with the first half of 2012 were up by 13% in unit volume. Single Family home sales in Park City remained relatively flat, but the median sales price was up by nearly 10%. Condominium sales saw a 10% rise in unit volume along with a 10% rise in the median price of Park City condominiums sold for the six month period. Vacant lot sales saw the largest increase with an increase in sales of over 30%. When compared to the last half of 2012, the Park City real estate sales data is actually down slightly in condominium sales and single family home sales, but up in building lots. However, median sales prices are up by approximately 10% in all categories. The increase in pricing correlates well with the low inventory levels. The same is true for the increase in building lot sales as potential buyers that cannot find properties that suit their wants and needs turn to building instead. Single family home inventory in the greater Park City area is now at a level of less than 10 months supply. But the supply for homes under $1M is less than 6 months at the current sales pace. 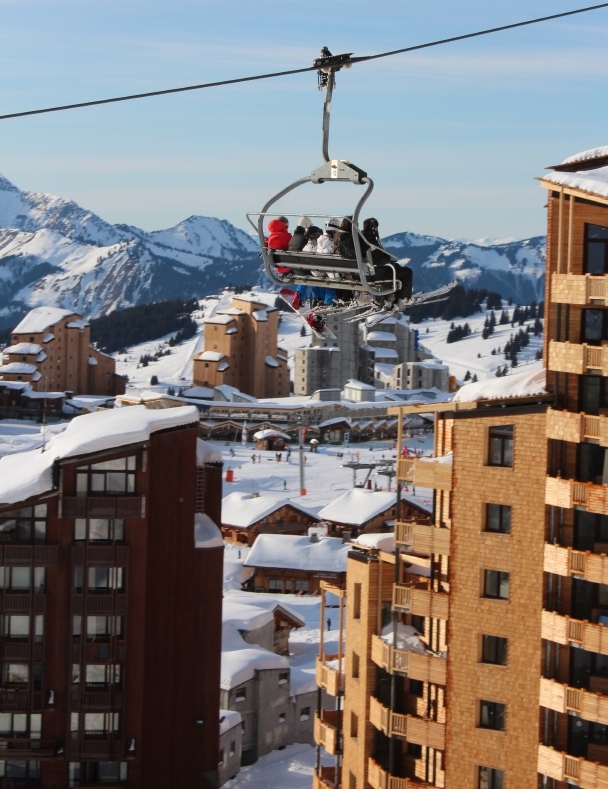 The situation is similar for condominiums in Park City: current supply is just less than 6 months at the present absorption rate when considering options listed for less than $500,000. The lack of inventory and the current demand especially in the non-luxury price points (less than $500,000 for condominiums and less than $1 million for homes) represent a big change during the past year. Sellers are welcoming the change while buyers have been caught off-guard. Every neighborhood in Park City is different and may have its own unique pricing influences. Contact us for an in depth conversation about the Park City property type and neighborhood that interests you (888)968-4672 or info@YouInParkCity.com. Posted in buyers, Park City Economy, Park City value, sellers | 0 Responses to "Park City Real Estate Sales 2013 "
Park City Home Buyers: Are You Worried the Market is Still Trending Down? 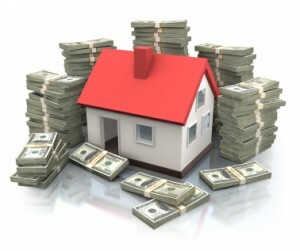 Here is a new program designed to insure the value of the home you are buying. 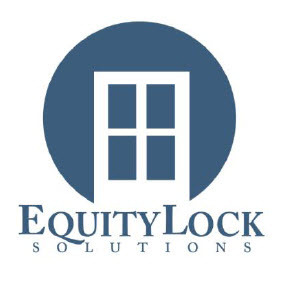 Equity Lock Solutions is offering a product called Home Price Protection. Generally the plan works like this: The buyer or seller of a home or condominium in Park City can purchase a plan of up to $2 million for a one time fee of 1.8-3.0% of the plan amount (costs vary slightly but Keller Williams agents have access to the lowest rates). The plan is tied to a local House Price Index published by the Federal Housing Finance Agency (FHFA). The index for the Park City area is tied to the Salt Lake City metropolitan statistical area. If the index drops from the time of purchase to the time of sale, the plan pays the percentage difference in the fall to the owner at the time of the sale. If you as a buyer purchased this price protection and bought a $1 million Park City home and five years from now when you go to sell the home the House Price Index has gone down 10%, the Home Price Protection Plan will pay you $100,000 when you sell the house. The plan is a hedge against the housing market going down, not the individual home, so choosing the correct home is still important. For more in-depth information about this program as well as the current HPI for your area, go to: http://equityocksolutions.com/faq/ . The NAR (National Association of Realtors) has picked Home Price Protection as their product of the year. This may give a buyer the peace of mind they are searching for as they wonder if they are truly buying at the bottom of the market. For more information about Home Price Protection or any Park City or Deer Valley, UT real estate questions contact a realty professional with the YouInParkCity.com Group of Keller Williams Park City Real Estate at (888)968-4672 or email us at info@YouInParkCity.com. Posted in buyers, Park City Economy, Park City Real Estate Notes | 0 Responses to "Park City Home Buyers: Are You Worried the Market is Still Trending Down?" 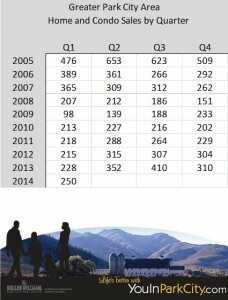 Luxury real estate sales in Park City, UT for the year so far show a slight decrease when compared to the pace of 2010. 2010 saw luxury home sales in Park City, UT buoyed by the St Regis Hotel at Deer Crest and Silver Strike Lodge at Empire Pass. 2011 is seeing strong sales from the new Montage at Empire Pass as well as continuing sales of the Flagstaff condominiums in Empire Pass. The 33 sales so far this year of homes or condominiums with asking prices over $2M include 6 Flagstaff condominiums and 5 Montage residences. With over 70 residences at the Montage still to be sold, the Montage will likely impact luxury sales in Park City for the foreseeable future. Also of note in recent sales are the sales of 3 homes (plus 2 pending contracts) in the Colony area of Canyons Resort. The average sale price for homes listed at over $2M remains fairly steady at nearly $3M. Relatively small sample sizes in this market combined with the occasional sale in the $10M range have impacts on this data. The luxury residence category overall is may be beginning to show more pricing pressure. 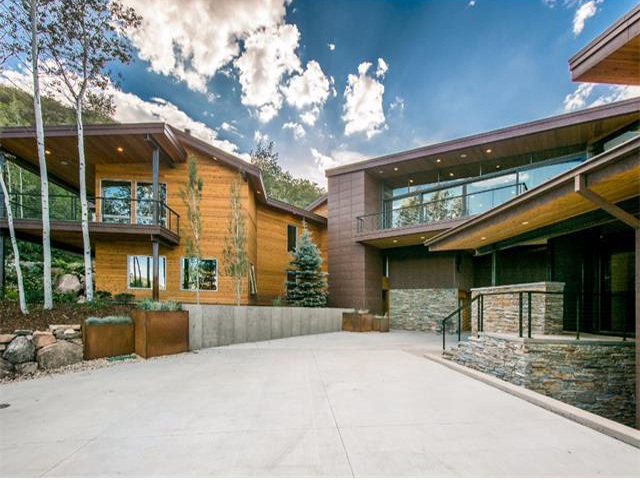 Currently the Park City MLS shows over 170 homes and 70 condominiums in the luxury category over $2M. Current sales show a discount rate of over 15% from asking price and the influence of undisclosed sales prices across the Park City MLS means that this discount rate could be considerably higher. The luxury home market in Park City and Deer Valley is a tough category to consider as a whole because there are many factors which makes each of the homes and condominiums in the luxury category unique. For a more complete analysis and in-depth information about individual properties contact a realty professional with YouInParkCity.com (888)968-4672. 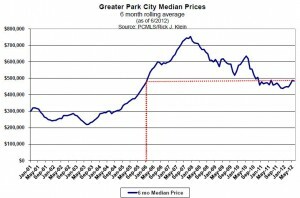 Posted in buyers, Park City Economy, Park City value, sellers | 0 Responses to "Park City Real Estate Luxury Sales 2011"